We really don't know the upper limits of how long Ebola can remain dormant in the body. Two to 21 days. If a person is exposed to the Ebola virus, that's the timeframe in which the symptoms of the disease can manifest. The disease kills about half of those it infects. That's the reality for the friends of Thomas Eric Duncan, the first victim of Ebola to die in the United States, who made contact with him before his hospital admission. According to NPR, the family that made contact with Duncan "has been ordered not to leave their home and is banned from hosting any visitors until the 21-day incubation period for Ebola has passed." So does that mean that on the 22nd day, they are in the clear, completely safe from contracting Ebola? No. Sadly, it's isn't so simple. "There is no quarantine time that will provide absolute assurance of no residual risk from contagion," Charles N. Haas, a microbiology threat researcher at Drexel University, writes in a recently published paper in the Journal PLOS Current Outbreaks. Symptoms typically begin to appear after nine days, but the World Health Organization has even recorded instances of a person contracting the disease after 30 days. A few weeks ago, when Ebola was starting to permeate the news, Haas began to wonder how WHO came to its 21-day quarantine recommendation for Ebola. Haas then compiled all the available data on previous outbreaks. What he found was that, thankfully, there aren't many data on past outbreaks. In the past, Ebola has affected a few hundred people at a time; not the thousands who have been blighted in the current crisis. The small number of data points means that while health authorities may have a good idea of how long Ebola can remain dormant in the body, they do not know the upper limits of what is possible. "If I pulled 12 people at random off the street and measured their height," Haas explained, "and then used the greatest high of those 12 as an index to what the maximum height would be for the human population, I would be incredibly wrong." In his analysis, Haas found that 21 days of quarantine "does not absolutely reduce the risk to zero of somebody subsequently becoming symptomatic," he said. Depending on the data set, he said, there could be as high as a 12 percent risk that a person will develop symptoms beyond 21 days. "While the 21 day quarantine value currently used may have arose from reasonable interpretation of early outbreak data, this work suggests a reconsideration is in order and that 21 days may not be sufficiently protective to public health," his paper concludes. On Oct. 16, WHO published its preliminary data of the first nine months of the Ebola outbreak in the New England Journal of Medicine. Drawing from the more than 4,000 cases documented during that period, WHO found "approximately 95 percent of the case patients had symptom onset within 21 days after exposure." That also means that 5 percent of cases manifested after 21 days. 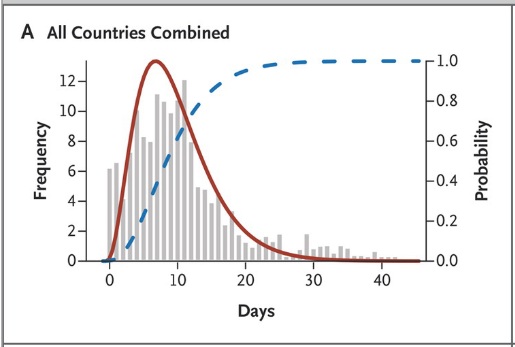 The following chart plots the number of cases recorded at each day after Ebola exposure. There are a handful reported after the 21-day mark. "Even if you go out to a 30-day time, it only gives you a risk of about eight in 1,000 that someone would still progress to symptoms after that period," Haas said. "I wouldn't want to characterize that as low or high because that is really a policy decision." At some point, the cost to monitor or quarantine a possible Ebola contamination outweighs the risks of infection. In a small outbreak, an eight-in-1,000 chance may not mean much. But in the worst case scenarios, where infections could reach 10,000 a week in December, those eight in every thousand begin to add up. "The bulk of people are developing symptoms by 15 days," Margaret Ann Harris, a spokeswoman for WHO, told National Journal. "However, we do not declare a country free of Ebola until 42 days have passed with no new cases." The lesson here isn't about increased panic, or that Ebola will strike the nurses or friends who treated Duncan without warning a month or more from now. It is a lesson on how we should think about and communicate about viral outbreaks. Science works on confidence intervals, distributions, and probabilities, which makes it tough to give an exact quarantine period after which a person is safe from contracting Ebola. Science is not about absolutes. Health authorities are getting a handle on this disease, but it's a tricky line assuring the public to be confident that the outbreak won't reach apocalyptic levels, while being realistic that Ebola may still hold some surprises. "I think a bit of frank sharing of the lack of knowledge would actually be helpful in having the public understand, Haas says.